(OPTIONAL STEP): Season chicken with salt and pepper. Heat a small amount of oil in a pan or skillet. Sear skin-side down (if using skin on thighs) first for 3 minutes, until deep golden brown. Rotate and sear the other side for a further 3 minutes. Arrange the potatoes in a 6qt slow cooker bowl in single layer. 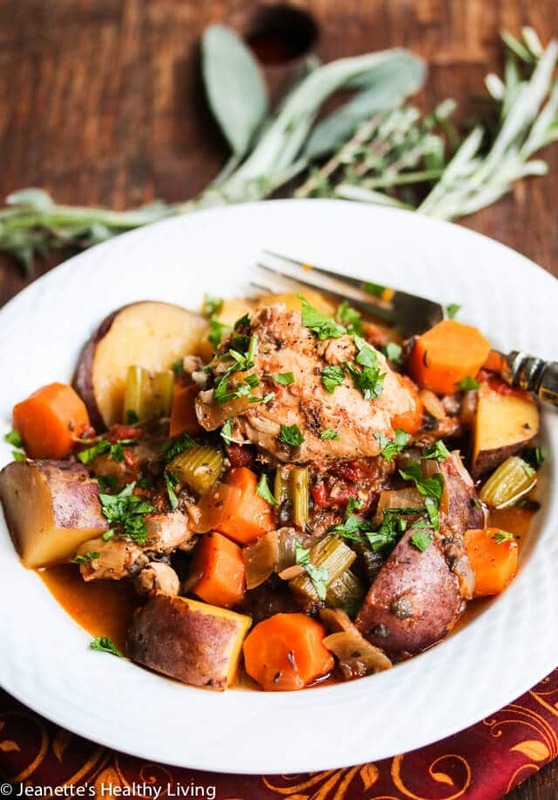 Place the chicken over the potatoes; and add the rest of the ingredients over the chicken (except olives and mushrooms). Stir to combine; cover and cook on high for 4 hours, or low for 8 hours, until the chicken is tender and falling off the bone. Add in the mushrooms and olives in the last 30 minutes of cooking. Season with extra salt, to your tastes and serve. Serve over rice, pasta or spaghetti squash. Season chicken with paprika, salt and pepper. Heat oil in a large skillet. Place chicken in pan and brown on both sides. Remove to slow cooker. Add onion, carrots, celery, and mushrooms to pan. Season to taste with salt and pepper. Saute until vegetables are fragrant and any liquid evaporates, about 5 minutes. 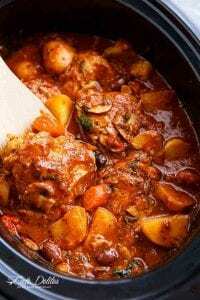 Scoop into slow cooker. Add potatoes, herbs, Roasted Garlic Tomato Sauce, and chicken broth to slow cooker and toss everything gently. Lay the pastry out to defrost. Preheat oven to 180°C (160 fan-forced). In a frying pan cook the chicken until it is just done and shred while hot with 2 forks. In the same frying pan cook the onion until translucent and add the rest of the vegetables with the cream of chicken condensed soup. Add the chicken and bring to the boil. 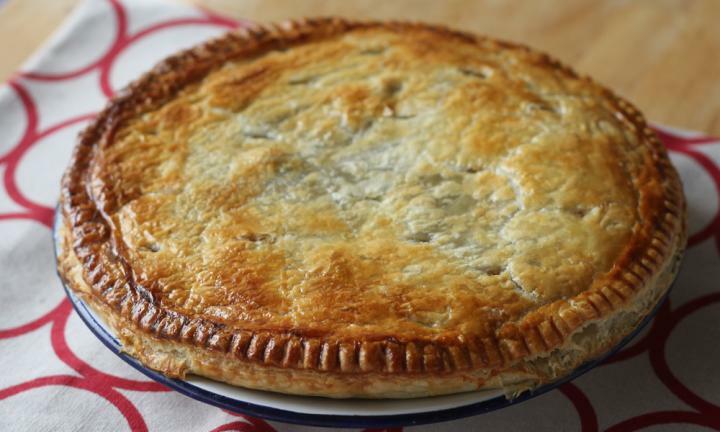 Spray a pie plate with cooking spray and place a layer of pastry in the bottom. Pour the chicken and vegetable mixture on top of the pastry and top with the second sheet of pastry. Press edges together and trim off excess pastry. Seal edges with the tines of a fork and brush the lid with egg yolk. Poke a few vent holes in the pastry with a sharp knife. Click on the shop now button to be taken to our website, where you can order all your poultry and gamemeat needs ONLINE, you can also have them delivered! Who didn’t say shopping can’t be easy and convenient? and set aside to cool slightly. - While they are cooking, slice the chicken breast in halves horizontally. - Heat half the coconut oil in a pan and place the chicken in the pan. While it is cooking, lightly dust the top side of the chicken with the turmeric powder. - Once cooked, set aside to cool slightly then slice into 1cm pieces. - Using the same pan, place the other half of the coconut oil in and add the pumpkin. - Cook on one side for approx. 2–3 minutes and turn over and do the same on the other side. Make sure it doesn’t go too soft. Set aside. 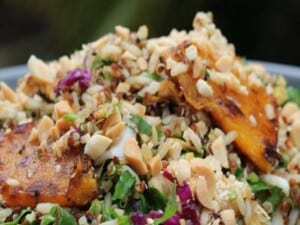 - Place all ingredients (except for the dressing ingredients and chopped peanuts) into a bowl and mix through (we used our hands as it was easier). - Combine all dressing ingredients in a separate bowl and whisk until combined. Pour the dressing over the salad and give it one last toss. 1. Preheat the oven to 180°C. Rinse the chicken and pat dry with a paper towel. 2. In a bowl, combine the butter, fresh herbs, lemon zest, garlic, salt and pepper. Using your fingers, starting at the neck end, separate the skin from the breast of the chicken, including the tops of the thigh/drumsticks. 3. Push the butter mixture under the skin and spread it evenly over the breast and tops of the thighs. Use your buttery hands to give the outside of the chicken a loving massage. Place the halved lemon and onion cut-side down in the base of a non-stick baking dish. Add the rosemary and parsley stalks and sit the chicken on top. Place in the oven with the breast facing the back of the oven. About half an hour later, spin it around so that the legs/thighs are facing the back. 4. 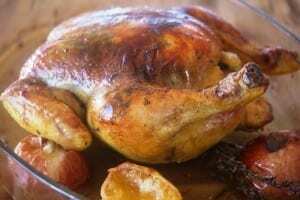 An hour is a subjective cooking time – depending on your oven, on whether the chicken’s legs are trussed shut, even the size of the baking dish have an impact on cooking time. To check that the chicken is cooked, pierce the thickest part of the thigh with a skewer and the juices should run clear. Another way to tell is if the leg joint feels loose in its socket, or when the chicken is picked up with tongs by its cavity, the juices run clear. The breast should be golden brown with a lovely layer of herbs underneath the skin. 5. To make the gravy, pour off any excess butter but be sure not to lose any of the cooked golden bits. Remove the onion, lemon halves and stalks. Place the baking dish on the smallest stove element. Using a spatula, stir in the flour and turn the element onto a low heat. Add stock a little at a time, stirring until thickened after each addition. The amount of stock you use depends on how thick you like the gravy. 6. Roast chicken can be served with any number of accompaniments. With these beautiful flavours I think it’s lovely with baby chat potatoes, tabouleh and maybe some flatbread.